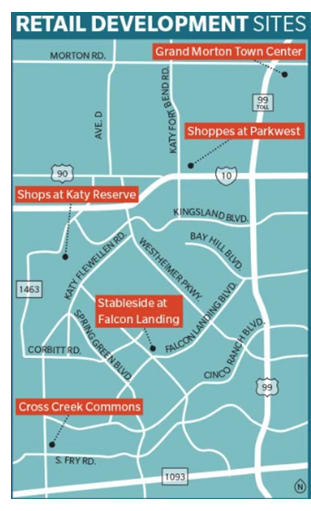 ​ KATY – The latest developments in Katy include the Shops at Katy Reserve, Stableside at Falcon Landing and Cross Creek Commons by NewQuest Properties in southwestern Katy. NewQuest is also developing Grand Morton Town Center in the northeastern part of the Katy area, while The Retail Connection is developing the Shoppes at Parkwest in the northwestern portion. ​Check out more data at Houston Retail Market Research.